Before you make purchasing decisions for your organization’s holiday banner signs it’s important to know the basic elements that make this kind of marketing campaign successful. Understanding what sets great signs apart from ineffective signs is a crucial step in ensuring your business or organization finds success during the holidays. 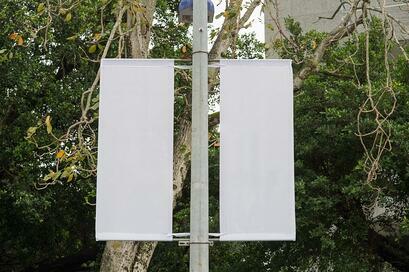 The most important element in the success of a banner advertising campaign is the message itself. Effective holiday banners can be read quickly and effortlessly by the intended audience. That means they are positioned in such a way to reach individuals most likely to be compelled to act. They also have a high degree of readability, effectively utilize the banner space, focus on the message to the audience, and are free from grammatical errors or confusing syntax. The way your message is worded is a critical aspect of compelling your audience to action. The copy on your holiday banner signs should be clear, concise, and relatable to the audience. Use a large, clear font for the banner’s main message. It should be simple enough to be understood quickly, but still provide sufficient detail so readers understand what’s being advertised. If the banner will be placed along a street and aimed at attracting the attention of drivers, the size of the text and banner itself will need to be larger than those intended for foot traffic. Drivers only have a few seconds to absorb the content of your banner and ensuring the message is clearly visible and quickly comprehensible is extremely important. The message and graphic design are the most important characteristics of an effective holiday banner. However, even the best banner design will be ineffective if the material it’s made from is substandard; low quality marketing materials will reflect poorly on you. Potential customers often make snap judgements about an organization based on the quality of their advertising presentation. When you use inexpensive banner media or flimsy sign frames, it reflects directly on the quality of product or service. No matter how great you are at what you do, if your customers don’t have chance to find out it won’t matter. Retractable banners are a popular choice for businesses and government organizations. This style of banner is easily rolled up for space-efficient storage and annual re-use. The problem that these organizations face when using lower-quality fabric with retractable frames is curling around the edges of the banner. From the moment of printing, this material begins to warp and curl, which is made even worse by being rolled up for storage. When you source your banner fabric from a print shop that offers premium brands such as Herculite Bantex, you can ensure your banners look great through repeated use. During the holidays, companies or organizations that adopt a banner advertising campaign face significant competition. Many competitors will likely be printing their own banners, leading a great deal of noise you must fight through to reach your audience. To stand apart from the crowd, the best banner advertisements have a distinct and eye-catching appearance that effectively draws the audience’s attention and gets them excited for your product, service, or event. The first way to stand apart from the crowd is through crisp, high-definition graphics and text. One easy way to give your banner an appearance that beats competitors is by working with a print shop that offers roll-to-roll digital inkjet printing. When working with these digital printers, it’s best to be sure you are using digital grade banner media to avoid any printing errors and get the highest-definition graphics possible. Screen grade is the most common banner fabric, but results in wrinkling, tracking issues, and head strikes when used with modern inkjet digital printers. Premium fabric like Bantex is specifically designed for use with digital printers and provides high-definition graphics that will catch the attention of passersby. If the sign will be in a location with poor lighting it’s advisable to use brighter colors so the banner will stand out. Additionally, controlling dot gain is important for banners located in dark areas. Dot gain is the spread of ink across the surface of a banner after application. When uncontrolled, dot gain leads to unintended darkening of the image. Microtexture surfacing in premium fabric brands controls dot gain and gives the graphics a 10% increase in resolution. Make sure your banners and signs leave a great first impression. Download our free guide, Best Practices for Maintaining Seasonal Banners and Signs.